After a white supremacist rally took over Charlottesville, Virginia in early August, much of the public’s collective response centred on the same baffled question: How could Nazis be marching in the streets in 2017? Marginalized people, however, were asking another question: How did it take so long for everyone else to notice white supremacy is alive and well? Members of targeted populations have since continued speaking out and reminding the rest that the infectious hate this summer has long felt inevitable—even before the rise of Donald Trump. They haven’t been the only ones shaking their heads, unsurprised and dismayed. Those who study extremism and radicalization in Canada have been sounding the alarm bell for years, warning about the increasing danger of the alt-right. Yet, few listened—now marginalized people and academics alike only hope the newfound attention on the alt-right is not coming too late. That renewed visibility has also contributed to the membership of established groups expanding. Alt-right recruits, according to Perry, are typically young men who enter the movement sometime after sixteen, and usually leave by the time they’re twenty-four. But the rising alt-right has caused that demographic to change, meaning more women are joining, as well as older and better educated, recruits. Perry says these members are more articulate in their views, and are able to mask them with smoother language. “I think that’s really important,” Perry says, “because it’s about sanitizing the movement.” This has allowed the alt-right to insert itself into conversations from which it’s traditionally been barred. More troubling, however, is that the alt-right has been allowed to gain traction. In the aftermath of 9/11, in particular, law enforcement officials have focused largely on terrorist groups such as ISIS, and haven’t taken alt-right extremism as seriously, says Ryan Scrivens, Perry’s co-author on “Uneasy Alliances” and a PhD candidate in the School of Criminology at Simon Fraser University. In 2013, when he and Perry started their study, Scrivens says there was no pressure on the government from the public, media, or law enforcement to care at all about the alt-right. The tendency to deny or ignore the threat has had big consequences: unchecked growth, bolder tactics, and increased organization—almost all entirely unimpeded. Now, even as public attention shifts to the alt-right, the movement’s already established foothold means it will be harder to push them out. The alt-right’s focus on combating immigration and refugees has allowed it to find support among more average white Canadians. They put forward the ludicrous narrative that jihadists will flood into Canada, kill innocents and eventually take over the state. But it plays on common fears: in a February Angus Reid survey, 41 percent of Canadians said too many refugees have been admitted into the country, 38 percent said Syrian refugees would not be welcomed in their neighbourhoods, and 25 percent would support a total ban, similar to Trump’s. Beyond merely ignoring this increasing momentum, Western governments have actually made it worse. Western guns, funding, and policy have helped keep the war in Syria alive and thriving. The devastation there has made five million people refugees, many of which have taken the dangerous journey to Europe and North America, toward supposed safety. 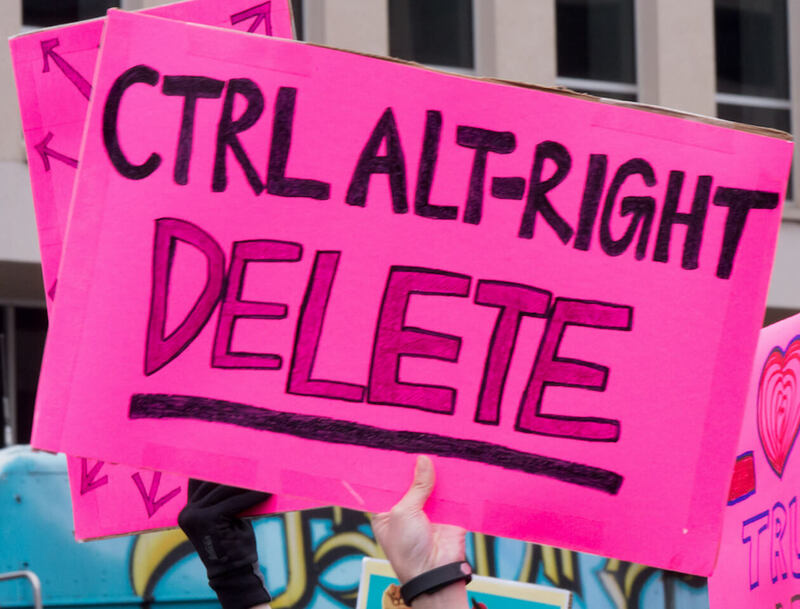 This crisis has become the alt-right’s best recruitment tool, and is allowing the once-fractured movement to rally under one cause, combining its considerable resources and growing popularity. It goes the other way as well. The unchecked growth of alt-right extremists, and resulting events like the Quebec mosque shooting, has allowed Salafi-jihadist groups to more effectively target Canadian Muslims. They are told they will “never be accepted in the West, and will always be on the outside,” says Amarasingam, “And that those who want to be part of the West will have to fundamentally give up who they are as Muslims.” The consequence of this connection is that the rise of one group will strengthen the other, leading to a loop of extremism and violence. The experts I spoke with all agreed that events over the last few months—the Quebec mosque shooting, Trump’s election, and now Charlottesville—have brought more attention to the alt-right than any time in recent memory. The question facing them now is: how can we keep up this pressure? And, perhaps more importantly: what can we do to fight these groups while we have momentum? Scrivens and Perry outlined a comprehensive strategy in “Uneasy Alliances.” Some jurisdictions in Canada have already adopted their suggested steps with some success. The authors say that BC and Alberta, for example, have been successful in managing threats to public order, meaning they’ve “demonstrated a strong and visible law enforcement response by developing teams that are grounded in collaborative and multi-sectorial approaches to addressing hate.” Other steps, such as raising awareness of the issue and pushing public agencies to act, however, have received very little effort. The media has an important role to play in this strategy. Scrivens says he and Perry were initially inundated with interview requests after releasing their 2015 study, but the attention quickly dried up. Sustained coverage, on the other hand, will allow reporters to develop expertise, help inform the public, and also put pressure on the government. A successful example of this in recent memory is the media’s role in bringing attention to police carding and racial profiling—the nationwide practice of stopping, questioning, and documenting people, even without any suspicion of a criminal offence, which disproportionately targeted black people. Law enforcement in general also must step up and take the threat more seriously. Scrivens notes that one crucial step is to improve relations with those affected by alt-right extremists. “Oftentimes community activists were trying to speak to law enforcement officials, and they were speaking to deaf ears,” says Scrivens, who has consulted these activists in his research. “Law enforcement officials didn’t want to have anything to do with these people. But these people, in fact, knew what was going on a lot better than me or you or the law enforcement officials.” Agencies that have done a better job with this, according to the “Uneasy Alliances” study, include Quebec’s provincial police force, which the authors say has a good understanding of the broad range of alt-right groups in the province, and thus more effectively monitors them. Law enforcement should also begin designating alt-right extremist groups as terrorist organizations, something for which more experts have already begun advocating , according to Amarasingam. Not only would it send a clear message to the public, but the law enforcement threshold would be lowered, so police would more easily be able to take action against the group, fundraising and mobilizing on behalf of the organization would become illegal, and more surveillance tactics would become available. This would allow law enforcement to intervene and disrupt these group’s activities much earlier, as opposed to what they can do now, which is being merely reactive. The responsibility, however, does not just fall on law enforcement. “The groups emerge out of our communities,” says Perry, “and need to be stopped through our community, through education, through social services, and community outreach.” Community members who feel able must also confront these groups when they make public displays, as they recently have in Vancouver, Quebec City, and London. Fighting the alt-right will be difficult. Because they have experienced some success, says Perry, the “appetite is now there, and it’s going to be hard to quench it.” Yet, without action and confrontation, there is only more violence ahead. Muslims have already been the target of 253 percent more hate crimes since 2012, according to Statistics Canada’s latest hate crimes report. Experts predict more lone wolf shooters. Amarasingam, meanwhile, says that the growing unity among alt-right groups and their pooling of resources could lead to mass casualty attacks, two of which were recently foiled in the US. That’s why all Canadians—from the public, to community groups, to media, to law enforcement, to politicians—must bring the fight to these groups now, without delay. But in order to do so, they must first admit that the alt-right has made its way aboveground, into the light, and is inching closer to being normalized.